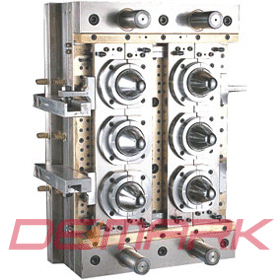 Demark Machinery, specialized in manufacturing Jar PET Preform Moulds@ (Wide-Mouth PET Preform Molds@) injection molding system, consists of technologists with rich experience, and senior engineers with master's degree and professional in 3D. We invite many technical committee members and senior professors in mould line are as the technical consultants for our company. Various kinds of processing equipment and detection measurement instrument are imported, as well as special drawing soft is applied in designing preform molds, samples and manufacturing testing mold. We supply special technology training and other good after-sales service. Demars company has a powerful team for research and development, which is capable of manufacturing the pet preform molds with one cavity to ninety-six cavities including the injection system. 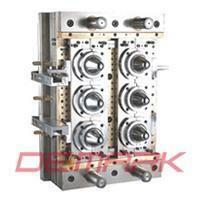 At the same time we can manufacture pet preform moulds especially according to customers' injection molding machines. We also design cold parts, hot runners and other main exchangeable components to fix on the imported pet preform molds. 1. No cutting of valve gate is employed to reduce the labor cost. 1. The main components of pet preform molds are made of S136 material (Sweden ASSAB). 2. The mold base is made of imported P20. plate method avoids corrosion efficaciously and assures long life service of the preform moulds.